I suppose there is a technical difference between cellaring and short-term aging. Cellaring wine, for me, means putting wine away for so long that you forget you have it and then are pleasantly surprised to discover you actually do NOT need to buy wine for Christmas 2015 because you actually bought wine for that occasion back in 2007! But even short-term aging--by my definition wine that you set aside for 1-3 years--can make for a nice discovery when, on a cold winter's night, you make yourself a soup or roast or even whip up some burgers and find that you have a perfect bottle of wine that's been sitting around waiting for you. As you know I drink mostly wine under $20, but even bottles that cost relatively little can benefit from some time to grow. What happens when they do? To my taste, the wines become smoother and more subtle. The fruit steps quietly aside and lets other notes--floral, herbal, woody--come forward. These are all transformations that I enjoy. 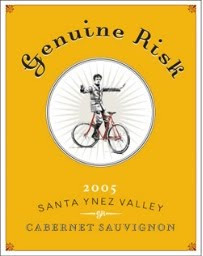 Take, for instance, my recent experience with the 2005 Black Sheep Finds "Genuine Risk" Cabernet Sauvignon. I bought it from online retailer domaine547 (now with an LA-based store, domaineLA) back in February 2008 for $20.99. Fast forward two years to February 2010. I loved this wine, and found it had excellent QPR because of its outstanding Cabernet characteristics. There were aromas of currant, plum, graphite, and licorice, all of which were echoed in the flavors. Hints of herbs and a nice spark of green pepper emerged, too, keeping the wine lively and interesting. It never became too vegetal, with red and purple fruit continuing through into the aftertaste. If you are interested in more recent releases, the 2006 is available. Based on my experience I'd recommend buying three bottles, enjoying one now for a point of comparison, and drinking the remaining two bottles sometime between 2011 and 2013. Folks often get stuck in the thinking that to get the benefit of aging, you have to throw bottles in the cellar for ages. Thanks for the reminder that 1-3 years can often let a wine settle and mature just enough to truly shine. Hmm.. Sems it's very impressive. I like it too. Looking for Affordable Pinot Noir?